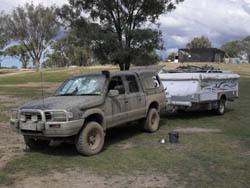 Plenty to chose from at this awesome Camp Grounds suit to 4X4 and Motorbikes. For Beginners there are lots of nice flat tracks which the occasional hill. For the boys who like to get dirty there are a few spots with some mud and also some steep slippery hill climbs. Soft roaders beware - some steep climbs with sharp rocks can ruin your day. A family camping with our group learnt the hard way when they attempted a leisurely drive up to the plateau - in their Merc (see pic) . A rock ruptured it\'s fuel tank half way up a hill.